Craving sugar all the time? Help! I’m addicted to sugar and I can’t stop eating it…what should I do? I’m so excited that this question came in from one of our readers. Sugar addiction is so common in our society, it’s likely touched each and every one of our lives. There’s no doubt about it, sugar tastes good. It’s one of the first tastes young children are able to discern easily (which is also one of the reason’s they love sweet foods so much). So while our love affair with everything sweet starts pretty early on, the issue of sugar addiction continues to get worse as we get older. In fact, eating sugar activates the same neurotrasmitters in the brain as taking cocaine. No wonder we love it so much and feel like we can’t stop eating it! Sugar literally activates the addiction cycle. What’s one thing we all know about addiction?! Well, like any addictive substance, we start to need more of it to feel good! Hence, the cycle of sugar cravings and going from needing one can of soda a day to drinking two-2 liter bottles per day. While our taste buds were always designed to favor sweet foods, the problem with sugar addiction actually increased dramatically about 20 years ago when fat fell out of favor in the diet. The diet culture was so obsessed with “fat-free” and “low-fat” foods, they forgot one thing…fat is oftentimes what gives a food its taste. When you remove the natural fat in a food, most of the taste goes along with it. Food engineers had a great solution to the problem…replace the fat with added sugar instead! While this may have solved the taste issue, it created a much bigger problem – increased rates of obesity, heart disease, diabetes, and other chronic conditions. Of course, it took a while for the link between added sugar and these issues to reach the mainstream media. Go ahead and take a look at a nutrition facts panel on one of your food items. If it’s a packaged food product and there is an amount listed under “sugar,” that means there’s been sugar added to the food. It’s a little sneaky though because it’s listed as grams and we tend to think of sugar in teaspoons. Well 4 grams of sugar is equal to about 1 teaspoon of sugar. That means that sugary drink you buy every day that has 35 grams of sugar in it, actually has about 8.75 teaspoons of sugar in it. And, that’s just in one drink…think of all the other foods and beverages you have throughout the day. You could easily be eating and drinking upwards of 30 teaspoons of sugar each day. The American Heart Association (AHA) recommends that you consume about 6 teaspoons of added sugar per day. This is actually still really high – we DON’T REALLY NEED any added sugar in our diet, so I would recommend keeping this number to the least amount possible. So, why is it recommended to eat 6 teaspoons per day? You guessed it, like anything else – food is a political game and those who have the money make the rules. Go cold turkey. Eliminate all added sugar from your diet. It will be really difficult for a few days, but if you’re able to do it, this is the quickest way to break the cycle. Start to slowly wean yourself off of sugar. If you add 8 packets of sugar to your morning coffee, only add 7 this week, then 6 next week, etc. This will take a little more time, but you won’t feel the withdraw effects as significantly as if you cut it all out at one time. Eliminate high-sugar drinks from your diet. Stop drinking fruit juice, soda, and sweetened teas. Instead opt for whole fruits and unsweetened teas. Read your nutrition labels. There are so many foods out there with added sugar that you wouldn’t even suspect have sugar added to them, like your prepackaged dinner meals and pasta sauce. 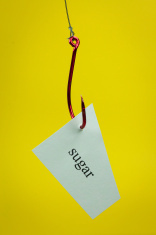 Opt for foods that advertise “no sugar added” if you’re purchasing pre-packaged foods. Avoid sugar alternatives. Let’s be honest, we all like to find the easy way around things if we can. The problem with sugar alternatives is that they’re usually either highly chemically-processed (very bad for us in other ways) or our brain recognizes them as sweet (such as in your “natural” sugar alternatives) and processes them similarly to the real thing anyway. That means you’re still addicted to sugar, you just have a different means of satisfying your craving or you’re substituting one addiction for another one. So, there you go, a few ways to help break the cycle of sugar addiction. Trust me, it won’t be easy, but you’ll be so happy that you did! Like any food addiction, once you’ve overcome it, you’ll start to notice your body feeling much healthier than it did before. Please remember that breaking the cycle of sugar addiction can be very difficult and it’s okay to ask for the support of a certified health coach.